In front of Sanbangsan back in 1989 by the Halla Ilbo newspaper. Today’s view below. Sunrise was at 5:54 a.m. and sunset will be at 7:10 p.m.
We have a high of 22°C with rain and cloud due all day. It’s going to get heavier from around lunch-time and into the afternoon. A light to gentle morning wind (2-3 m/s) is going to get stronger later. Prepare for the trail accordingly. Jeju City’s Five Day Market in 1986 looking out towards the airport and over old Jeju City by the Halla Ilbo Newspaper. Sunrise was at 5:55 a.m. and sunset will be at 7:09 p.m.
We have a high of 23°C with little cloud to clear sky and a light wind (2 m/s) blowing south-west then south-east. Overall it will be another great day on the trail. However, watch out for the rain from tomorrow morning all the way through to Wednesday. Saesom as it Was in front of downtown Seogwipo and Route 7. Taken 30 years ago by the Halla Ilbo Newspaper. A more recent view is below. Sunrise was at 5:58 a.m. and sunset will be at 7:07 p.m.
We have a high of 19°C with little cloud to clear sky. 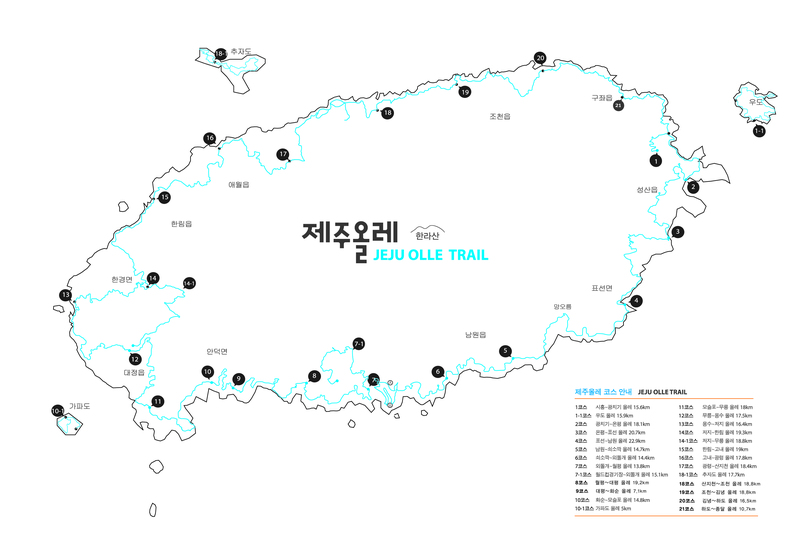 A morning light air (1 m/s – rare for Jeju) will give way to moderate wind (6 m/s) later on. Overall it’s another good day on the trail. Cleaning the Beach during our Clean Olle event along Route 14 on April 13. By Lee Seong-gwan. Sunrise was at 6:03 a.m. and sunset will be at 7:04 p.m. It is going to be a lovely day outside once again with a high of 17°C and clear sky above. A light air (1 m/s – rare for Jeju) to light wind (2m/s) is going to blow west then south.